It’s cyclone season up north and with the onset of cyclone Christine and predicted storm surges in the Pilbara district, all eyes are watching. 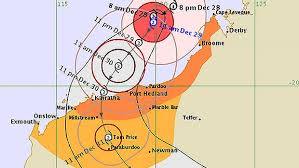 Cyclone Christine is expected to unleash “very destructive winds with gusts in excess of 200 kilometres per hour are likely near the centre as the cyclone crosses the coast. Destructive winds with gusts in excess of 130 kilometres per hour are expected in the Karratha and Dampier region later tonight, extending well inland overnight and during Tuesday” (DFES). SES are presently preparing to deploy to assist the communities affected, should they be needed. For those of our members on standby to deploy to the Pilbara for Cyclone Christine, we wish you a very good nights sleep! This entry was posted in Website by Erica. Bookmark the permalink.